Recently, when a major publisher began looking for a novelist to team up with international entertainment icon, Willie Nelson, they came straight to Mike Blakely. Blakely and Nelson are currently working on their co-written western novel, designed to adapt to the big screen, with Willie himself playing the lead role. The book is scheduled for release by 2008. Meanwhile, native Texan Mike Blakely continues to leave his creative footprints across the landscapes of Texas, the U.S., and the world, as the author of 15 books and a performing songwriter with six CDs to his credit. Most of Mike's books are historical novels set in the American West, and released by major New York City publishing houses. His CDs, showcasing his songwriting and musical abilities, have all been released on Mike's own record label, Swing Rider Records. As a performing singer/songwriter, Mike – often accompanied by band members -- has enjoyed his greatest successes in Texas and Switzerland, but his talents have taken him to numerous other places, as well. He's performed coast-to-coast and border-to-border in the U.S., and has entertained audiences in Australia, Austria, Holland, Germany, Italy, and Mexico. As a novelist, he has enjoyed national distribution, with his books selling in Barnes & Nobles, Hastings, Borders, WalMart, and many other outlets, including independent bookstores everywhere. He is a winner of the Spur Award for Best Western Novel, given annually by Western Writers of America, a national organization of professional writers. Mike Blakely grew up in Wharton County on the Coastal Plains of Texas – one of the richest farm and ranch regions in the country. He was cowboying on family ranches by the time he was six years old. He learned to play the guitar at age eight, taught by his musically inclined father. He started training horses as a teenager, about the same time he began writing songs, and dreaming of writing novels. Mike performed in two dance hall bands in high school, and caught a chronic case of honky-tonk fever. After high school and a hitch in the United States Air Force as a helicopter mechanic, Mike attended the University of Texas at Austin, and graduated with a degree in journalism. Setting aside his career as a performing musician for a while, he concentrated on writing free-lance magazine and newspaper articles, racking up hundreds of by-line credits. His writing career shifted from journalism to fiction after the publication of his first novel in 1990. Though he wasn't playing much live music during this time, he continued to write songs. With his career as a novelist established, Mike again turned his attention to musical endeavors, deciding to concentrate on performing and recording his own compositions. He bought a horse ranch near Marble Falls, Texas, and had the good fortune of meeting songwriter, John Arthur Martinez. Blakely and Martinez began a songwriting partnership, composed numerous songs together, and landed cuts on major record labels such at Arista and Dualtone. Also in Marble Falls, Mike met Larry Nye, renowned guitar player and owner of Lazy L Recording Studio in Kingsland, Texas; and bassist Donnie Price, of Buchanan Dam, Texas. The three musicians formed the band that would come to be known as Mike Blakely Y Los Yahoos and began performing everywhere from Texas to Switzerland. Other configurations built around this core band have included Mike Blakely & The Whiskey Traders, and The Swing Riders, featuring Doc Blakely and Mike Blakely. 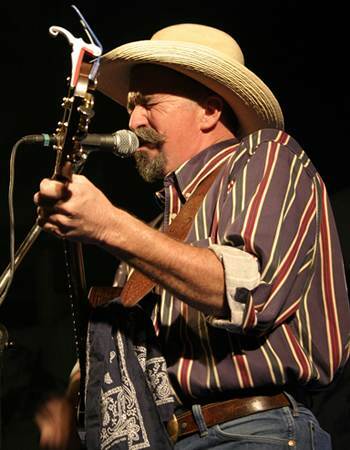 Though Mike made a few trips to Nashville to pitch songs, he became quickly disenchanted with the major-label country music business, and decided to focus on recording and performing his own songs for his own fans, through the establishment of his independent record label, Swing Rider Records. Though he rarely pitches tunes to other artists, his songwriting has caught the attention of some legends on the Texas music scene, and several of his compositions have been covered by artists such as Grammy-winner Flaco Jimenez with Raul Malo (of The Mavericks), Gary P. Nunn, Larry Joe Taylor, Geronimo Trevino and Johnny Rodriguez, Craig Chambers, Debbi Walton, Pauline Reese, Becca Dalrymple and others. Mike co-wrote three songs on John Arthur Martinez's 2004 Dualtone Records release, "Lone Starry Night." In 2002, Luckenbach, Texas, Inc. contacted Mike about establishing an annual music and book festival. Working with Luckenbach manager, Neal Brown, a veteran promoter on the Texas music scene, Mike put together a unique gathering of Texas authors and musicians – Mike Blakely's TexAmericana Fandango. Now in its fifth year, the Fandango has proven a success from the very first year and has attracted thousands of fans to the legendary Texas venue. Mike Blakely has served as president of Western Writers of America (WWA) and for many years sat on the board of the Ozark Creative Writers, Eureka Springs, Arkansas. Three of Mike's novels have been finalists for the WWA Spur Award, and one, "Summer of Pearls," won the award in 2001, and was also a finalist for the Violet Crown Award given by the Texas Writers League. His dual career as a novelist and a performing songwriter doesn't leave Mike much spare time, but he enjoys his ranch near Marble Falls, Texas, and likes to ride and train horses, hunt and fish, and travel. He is as comfortable on the back of a horse as he is at a book signing or a live musical performance. Mike Blakely is a rare talent, a prolific writer, and an established veteran of the American entertainment industry in print, over the airwaves, and on stage.